Glider is double-slider style featuring sash rollers for ease of operation and cam style sash lock for positive seal and security. All units feature an aluminum-framed, fiberglass mesh full screen. Welded corners provide a quality finish and eliminate leaking. "Perma-Buk III" is compatible with wood, aluminum or steel forms. 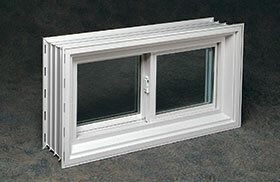 Frame design provides an attractive finished opening eliminating the need for additional trim. Factory punched tie slots 36" on center for easier installation into aluminum and steel forms. Pre-mounted well bolts and mounting plates are available to simplify window well mounting. Accessory groove in frame allows use of various trim products. Optional Low-e glass for improved thermal performance. NV3S3216W7 NA 36-13/16" x 20-1/16" x 7-7/8"
NV3S3220W7 NA 36-13/16" x 24-1/16" x 7-7/8"
NV3S3224W7 NA 36-13/16" x 28-1/16" x 7-7/8"
NV3S4848W7 NA 52-13/16" x 52-5/16" x 7-7/8"